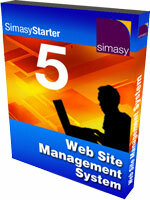 If you are a small company or self-employed person just starting out with a new web site or would just like to have a personal web site, SimasyStarter is the ideal solution. It comes in two versions: SimasyStarter:5 and SimasyStarter:10. £149 per year - Nothing else to pay! Create and edit a web site of up to 5 text and image based web pages and manage your own image library. Select a design from the Theme library. Web hosting package with 50Mb web space, 5 email addresses, Webmail, SpamAssassin mail Spam Filters and optional mail virus filtering. If you want your own design, we will integrate your existing website design into Simasy (£300) or create a completely new design using the latest web technologies. £199 per year - Nothing else to pay! Create and edit a web site of up to 10 text and image based web pages and manage your own image library. Web hosting package with 100Mb web space, 10 email addresses, Webmail, SpamAssassin mail Spam Filters and optional mail virus filtering. Add extra dynamic functionality to your web site such as News, Case Studies, Events, Downloads, Search, and many more.